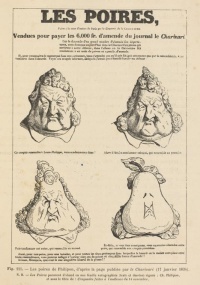 The anti-royalist cartoon Les Poires by Daumier after Philipon. Republicanism is the ideology of governing a society or state as a republic, where the head of state is appointed by means other than heredity, often through elections. The exact meaning of republicanism varies depending on the cultural and historical context. In general it implies the absence of monarchy, but it may indicate anything from 'rule by many people and by law', through oligarchy, to arbitrary rule by one person. Republicanism existed as an identifiable movement in the Roman Republic, where the founder of the Republic, Lucius Junius Brutus, denounced the former Roman Kingdom and had the Roman people declare a solemn oath to never allow a monarchy to return again. Tacitean studies - differing interpretations whether Tacitus defended republicanism ("red Tacitists") or the contrary ("black Tacitists"). Unless indicated otherwise, the text in this article is either based on Wikipedia article "Republicanism" or another language Wikipedia page thereof used under the terms of the GNU Free Documentation License; or on original research by Jahsonic and friends. See Art and Popular Culture's copyright notice. This page was last modified 21:28, 12 March 2018.